Beeston Castle’s history stretches back several thousand years. The castle’s isolated sandstone crag rises 365 feet above the Cheshire Plain and is visible from both the Welsh mountains and the Pennines. There’s little doubt that our distant ancestors were drawn to the hill; and one of its earliest names, Buistan, recorded in the Domesday Book, means something like ‘market rock’. To the Romans, Beeston was known as Bovis, from the Latin for cattle; and there is still a cattle market in Beeston village today. Neolithic stone tools have been found nearby; a Bronze Age settlement with evidence of bronze casting was excavated within the outer ward in the 1980s; and the Iron Age earthworks of a large hillfort underlie much of the medieval curtain wall, halfway up the hill. The hilltop may have had religious significance for our ancestors, too. It’s easy to imagine huge Beltane fires surrounded by worshippers illuminating the summit every May Day, perhaps over many centuries. Since time immemorial, Beeston has been an important place. So when the 6th Earl of Chester, Ranulph de Blundeville chose Beeston Crag for his new castle, in 1225, the site was already ancient and important. The new castle incorporated all the state-of-the-art techniques Ranulph had witnessed during his time fighting in the Middle East during the Fifth Crusade. Beeston Castle comprises two main parts: the inner bailey with its broad rock-cut ditch, massive gatehouse, circular defensive towers and deep historic well; and the larger outer bailey with its own separate well, massive gateway, ditch, and curtain wall punctuated by seven semi-circular defensive towers. Yet medieval castles took decades to build, and neither Ranulph nor his successor lived to see its completion. Soon afterwards, Beeston was taken over by King Henry III who used it as a fortress and prison in his rekindled wars with Wales. Beeston was subsequently modified by his son, Edward I, to bring it into line with ten new fortresses built to enforce the final suppression of the Welsh. Before King Richard II sailed from Chester to Ireland in 1399, legend says he hid his vast royal treasure in passages leading off the well at Beeston. Contemporary accounts mention ‘100,000 marks in gold coin, and 100,000 marks in other precious objects’. Unfortunately for generations of treasure seekers, there is evidence to suggest the treasure was captured by Henry Bolinbroke and used to pay off his supporters. Even so, there have been at least two organised explorations down the well, in 1842 and 1935. But, as yet, no treasure has been found. By the early 16th century, Beeston Castle had become redundant; and was described by Leland, the royal historian, as ‘shattered and ruinous’. The Castle was refortified during the Civil War. Three hundred Parliamentarians occupied the Castle in 1643, but when a brave Royalist captain and eight of his men climbed the sheer crag at night, they managed to trick the garrison into surrendering. The Royalists then held Beeston. They were besieged for over a year, and eventually starved out. When the War ended, orders were given to dismantle the fortifications, and the castle was reduced to its current state. 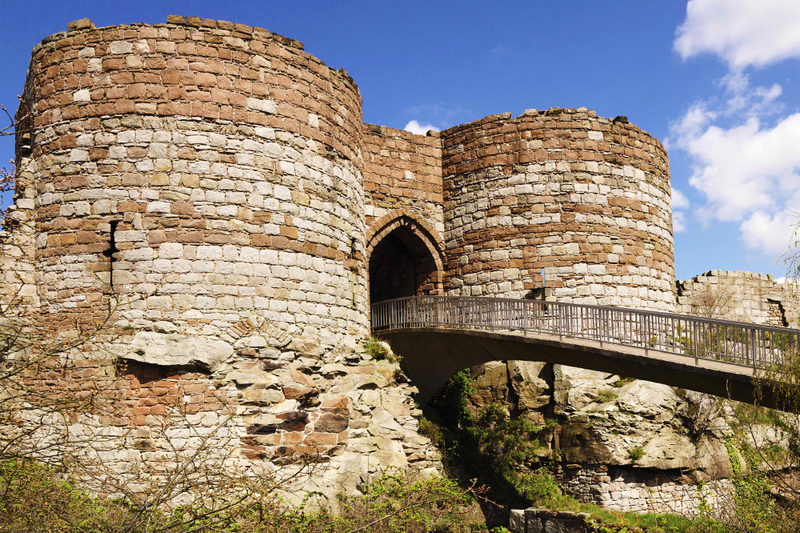 Beeston Castle has been a popular local venue for fetes and day trips for centuries. Today, it’s cared for by English Heritage. Facilities include the ‘Castle of the Rock’ exhibition, gift shop and toilets. There is also an innovative events programme including medieval re-enactments. The panoramic view from the summit reputedly spans seven old counties, and visitors may borrow binoculars from the ticket desk. The summit also makes an ideal spot for summer picnics. October 1st and March 31st. For more information, call the ticket office direct on: 01829 260464. There are two lovely walks within the castle grounds: one to the summit and its breathtaking panoramic views, and the other around the base of the crag inside the perimeter wall. Nearby walks include a pretty section of the Sandstone Trail, and several circular routes exploring the Llangollen Canal, Peckforton Hills, Pekcforton village, and Peckforton Mere. For further details, see Walk 7 in Walks in Mysterious Cheshire and Wirral , Walk 12 in Walks in West Cheshire and Wirral, or Walk 5 in Top 10 Walks: Cheshire: Easy Walks from the Sandstone Trail.